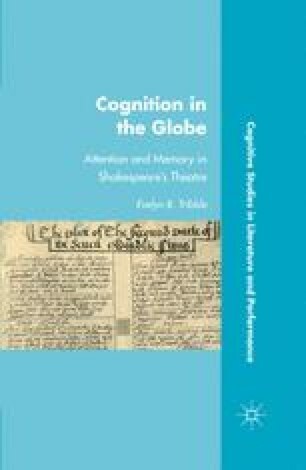 Throughout this book I have argued that a distributed or systems-based model of cognition best accounts for the complex relationships among insides, objects, environments, and people that comprise the early modern theatrical system. Viewing the theatre as a dynamic system allows us to keep a range of levels of analysis in play without privileging any one. This distributed/systems level of analysis can equally be seen as an ecological approach. In this conclusion, I refine and extend this model through an examination of the concept of “cognitive ecology,” which I test here through a brief analysis of a range of theatrical organizations other than the early modern adult sharer-repertory system. A model of cognitive ecology posits that a complex human activity such as theatre must be understood across the entire system, which includes such elements as neural and psychological mechanisms underpinning the task dynamics; the physical environment(s), including the relationships between playing and audience space; cognitive artifacts such as parts, plots, and playbooks; technologies, such as sound or lighting; the social systems underpinning the company, including the mechanisms for enskillment; the economic models by which the company runs; the wider social and political contexts, including censorship, patronage, and commercial considerations; and the relative emphasis placed upon various elements of the enterprise, including writerly or directorial control, clowning, visuality, and improvisation.